A wise man for whom I worked shared insight in to my flawed personality during a performance appraisal for the previous year during which all objectives had been successfully achieved. Although worthy of banner waving, he gently explained a concept describing the manner in which I executed the attainment of those goals and coached alternative approaches. The term he used to describe my award-winning tactics is usually reserved for fighter pilots in the heat of combat -Target Fixation. Wikipedia defines Target fixation as a process by which the brain is focused so intently on an observed object that awareness of other obstacles or hazards can diminish. In the process of accomplishing my objectives I would eliminate, remove, ignore, or run over any obstacle in between me and the objective as I became increasingly fixated on the target, leaving dead bodies and injured parties in my wake. Well folks, old habits are hard to break. 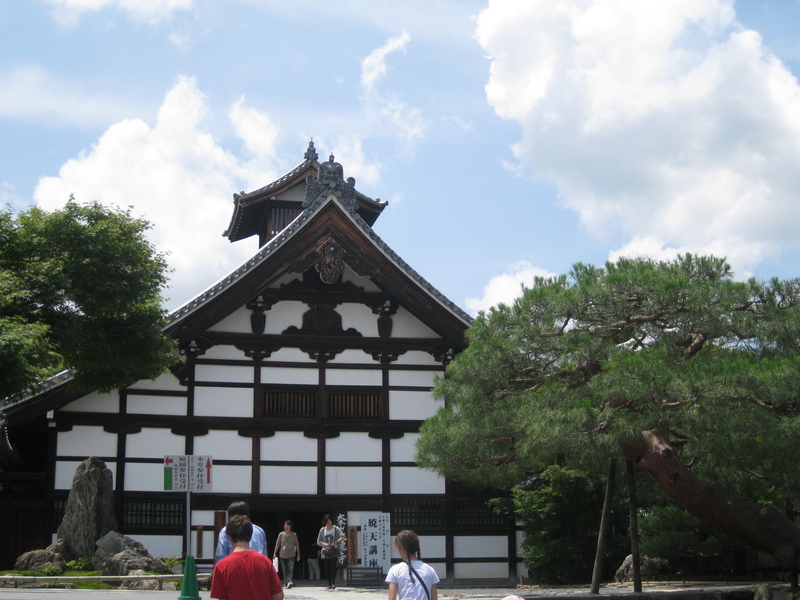 The day’s agenda was full, populated with the Hozu-gawa River, the Romance Train, the Sanjusangen-do Temple, the Tenryuji Temple, the Bamboo Forest, and the Golden Pavilion. We hired a cab driver to usher our foursome around until 5:00- a full 9 hours to get our Zen on. My target to see a record number of World Heritage sites during that time frame locked and loaded. The potential collateral damage sat innocently beside me…. When I left you hanging anxiously awaiting the next pulse quickening post, the boat tour down the Hozu-gawa ended with a protein packed snack in the form of grilled squid. For the other 12 passengers the day was captured, memorialized and ruined by the antics of one Offspring #1, his face blocked out to prevent the Japanese mafia from tracking him down to remove his left pinkie with a finger nail file. Perhaps only the Clampitts and the pink clad man and his wife to the left will savor the following mantle quality still, thinking back on the rapids, the captain splashing us with water and the Offspring’s embarrassment when I retaliated by pretending to push the Captain in the water as he walked along the boat railing to the back. After much bowing in gratitude and a lunch break, we rounded the corner to Tenryuji Temple- famous for its Zen Buddhist gardens. It was not on the original tour since it sounded so dull, however, Andretti-san kept adding it to the list every time I removed it. Once I discovered its membership in the esteemed World Heritage Club, the arguing abated and the deletion of its stop on the tour ceased. 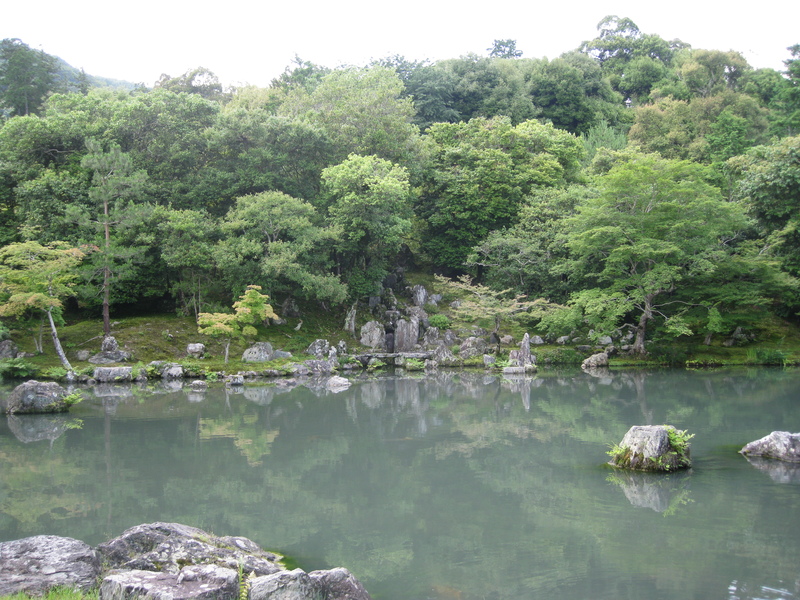 Built in 1335, Tenryuji is the only remaining of the 5 Japanese Mountain Sites used by the early Shogunates to help govern Japan during turbulent times. I didn’t expect to see this when looking inside. Someone needs a walk around the gardens. 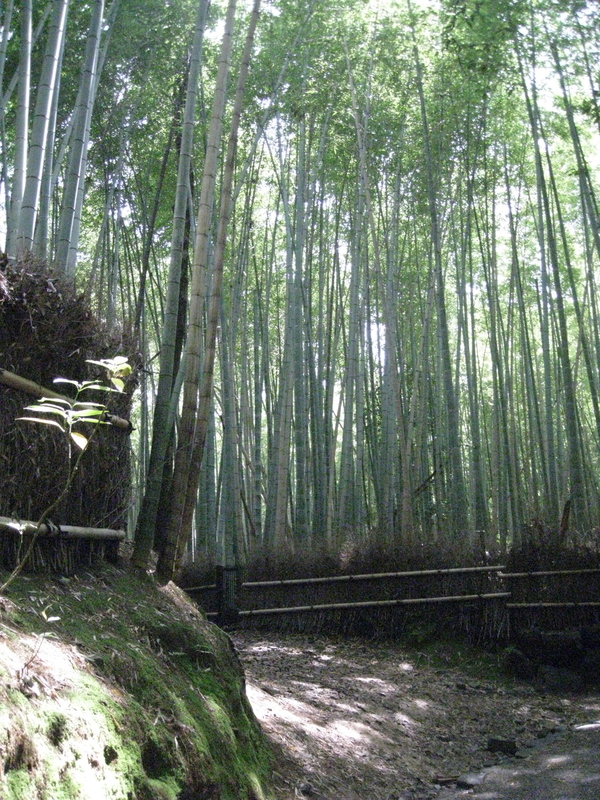 Just beyond Tenryuji is the famed Bamboo Forest. Next time through no need for a cab, we’ll just let the mosquitoes carry us up the path. Really, do people have to carve their names in EVERYTHING? When I find this Stein, I’m going to have a talk with him and his mother- for naming her kid after a drinking mug. 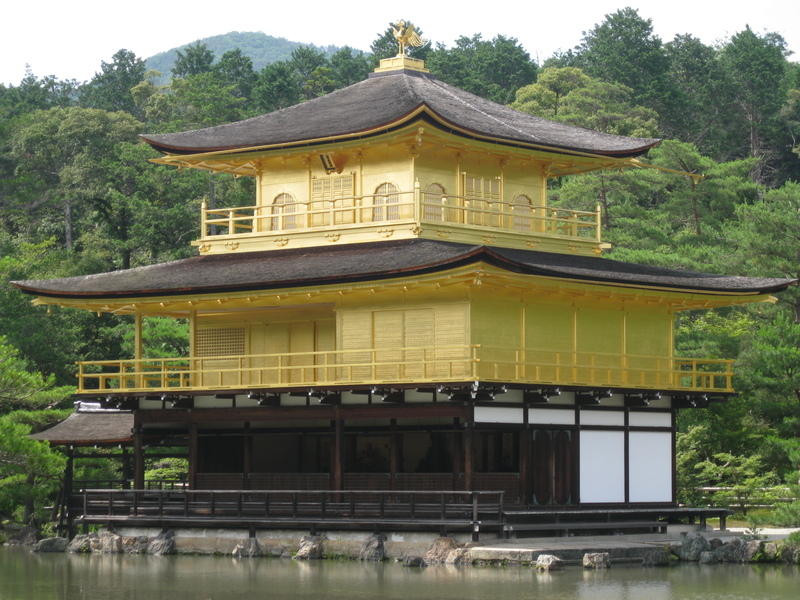 Rokuon-ji- The Golden Pavilion. World Heritage Site #2. Recently re-guilded as she was losing that fresh-faced luster after 700 odd years. Unknown and unseen by visitors, the lacquered inside was also repainted. Unfortunately, the only recent American given an opportunity to see this site, George Bush Sr, declined the exclusive invitation claiming a hole in his sock. No lie. On my part. Whether it was on his only he knows, however, if so, the cleaning crew at the White House needs a cleaning. 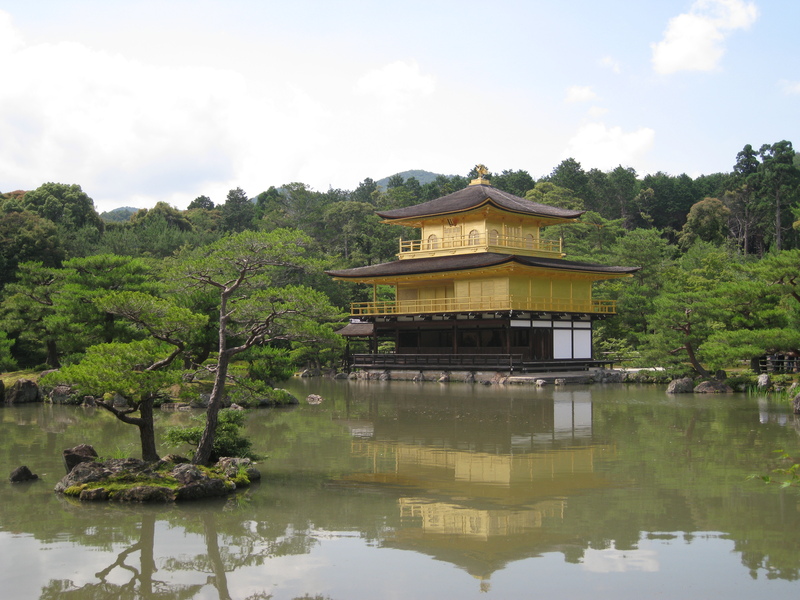 My camera heard rumors of a replacement and decided to take “TokyoBlingsblog” quality pictures of the Golden Pavilion. 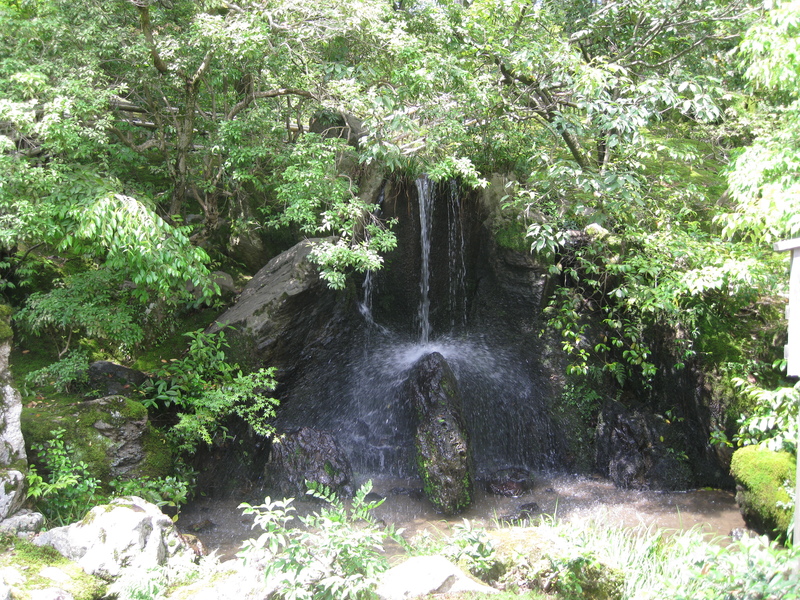 Nothing screams “Zen” like a waterfall. 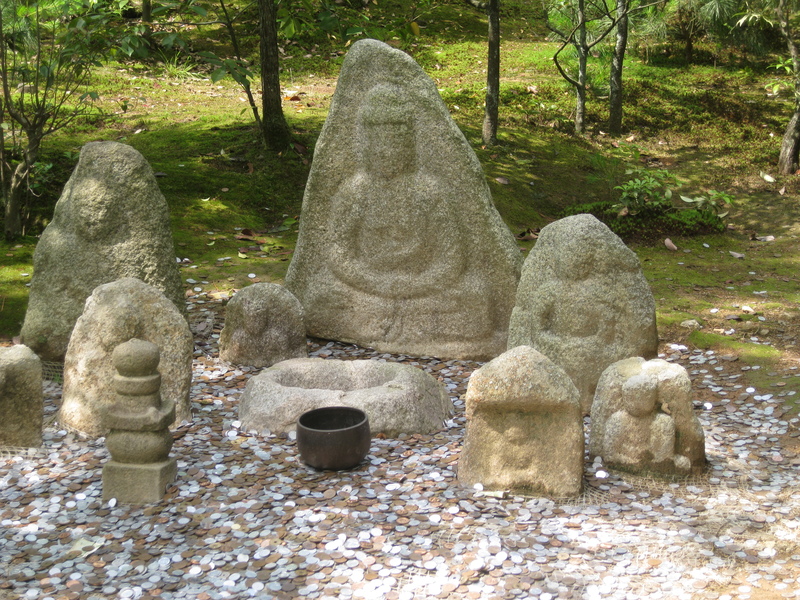 Or an exhilarating game of quarters with a grouping of Buddhas. Doesn’t someone always get frustrated and eventually throw in a pair of underwear? 2:00 PM-I happily ticked five agenda items off the itinerary, two of which were World Heritage Sites, and I’d fed the hostiles. When we found her at the end of the trail, Grandmama made a pitiful Eor impersonation, bucket hat flattened alongside her ears, all body parts drooped toward the scorching pavement. Glassy, unseeing shark eyeballs rotated slowly in my direction, luckily she lacked sufficient get up and go to bite. This girl was closer to rolling belly up. Her head fell forward on her chest approximating a nod in the affirmative. The cab had more breathing room with Grandmama gone. 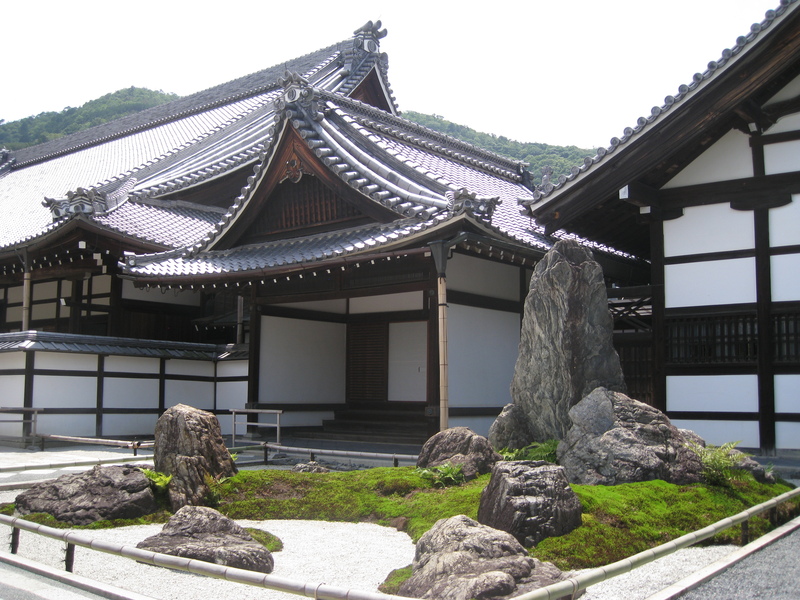 Our next stop was Sanjusangen-do- the formal name is Rengeo-in Temple. Most people know it as “1000 Buddhas.”Originally built in 1164, lost in a fire, and rebuilt in 1266, the current building is original. Technically it’s a National Treasure. I counted it as another World Heritage Site since it should eventually make the list. Number 3- unofficially. Nothing to look at from the outside…. 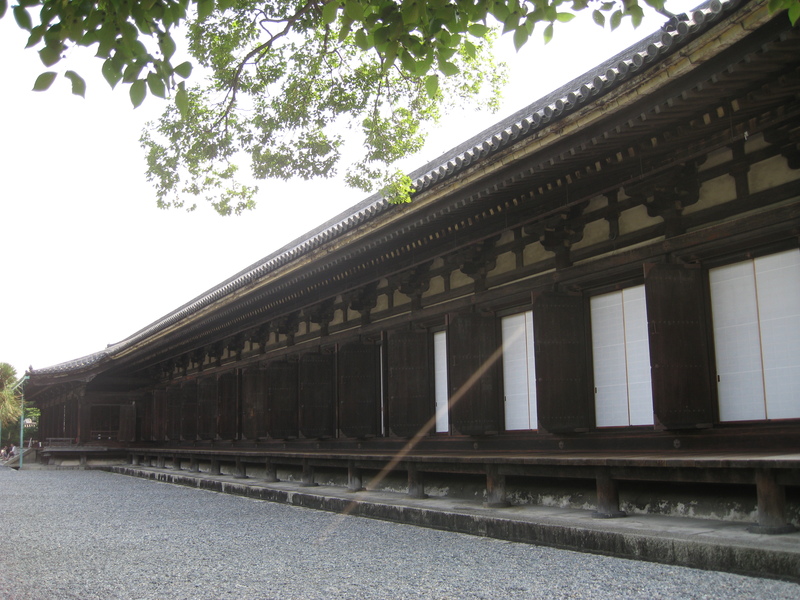 The inside is a cavernous hallway with a fading painted ceiling, wood beam plank studs, and darkness lit by “candle light,” revealing 1000 solemn Buddhas ( Juichimen-senju-sengen Kanzeonor- Kannon for short) and the 28 dieties placed in front to guard them. 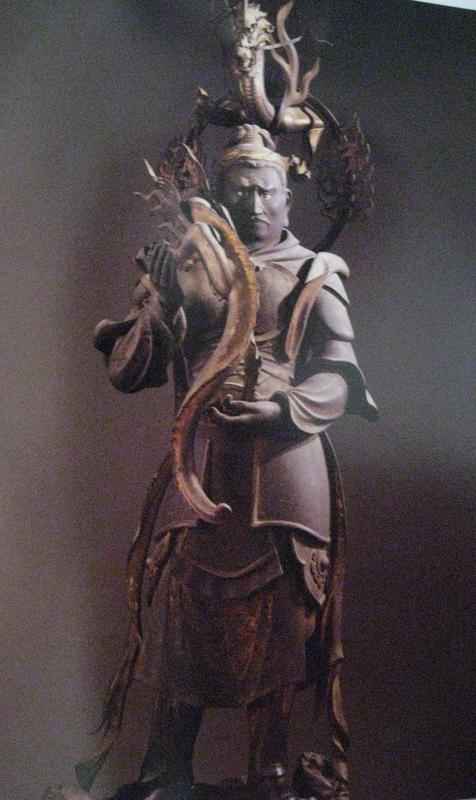 The statues are made of Japanese cypress- 124 were made in 12th century, the remaining 876 in the 13th century. The life sized guardian dieties’ marble eyes watch the crowd walk by, ready to pounce at the first provocation. Can you tell I’m impressed? I can’t even joke about it. How these Buddhas survived 9 centuries without being devoured by the hoards of insect species which were devouring us as we toured the facility was either divine intervention or the incense. Pictures were not allowed of the sacred images. 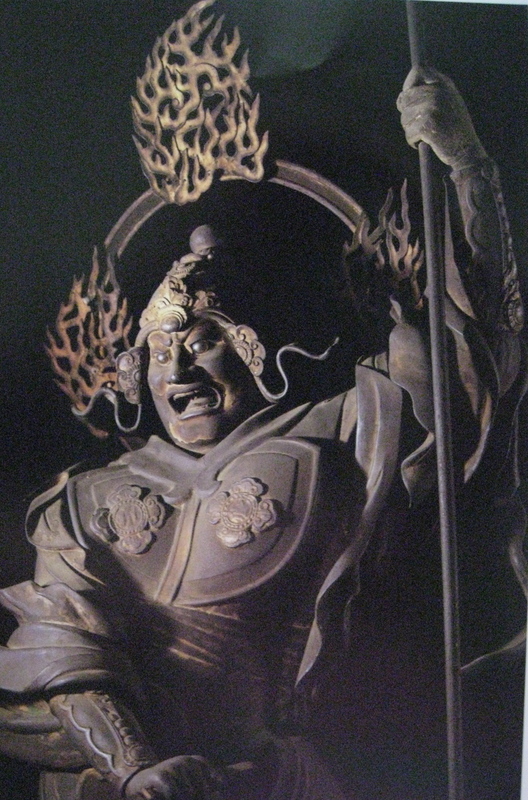 The images below are from the guidebook “Buddhist Dieties of Sanjusangen-do Temple,” Published by Myoho-in, the Head Temple of Sanjusangen-do, Printed in January 2008, Photographs by Askaen Co., Ltd./Kozo Ogawa, Produced by Askaen Co., Ltd. 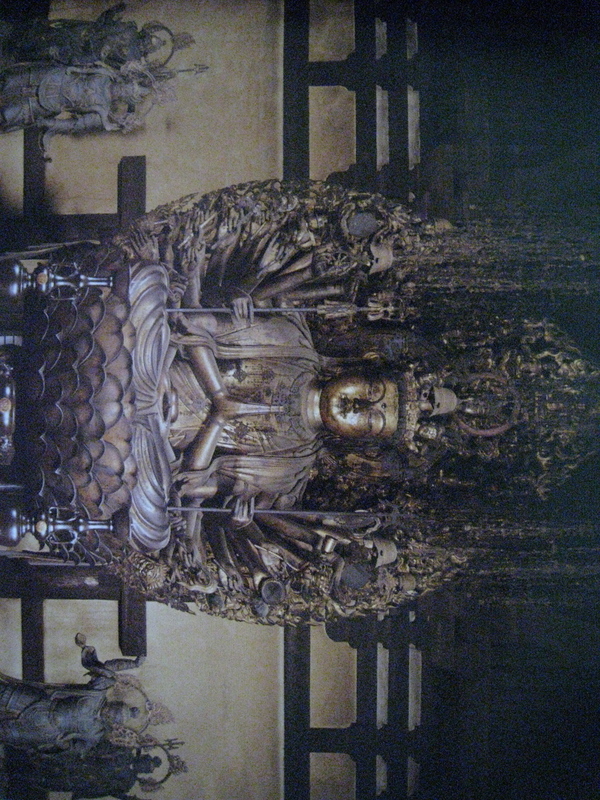 The Giant Buddha sits in the center of the hall- also a National Treasure. 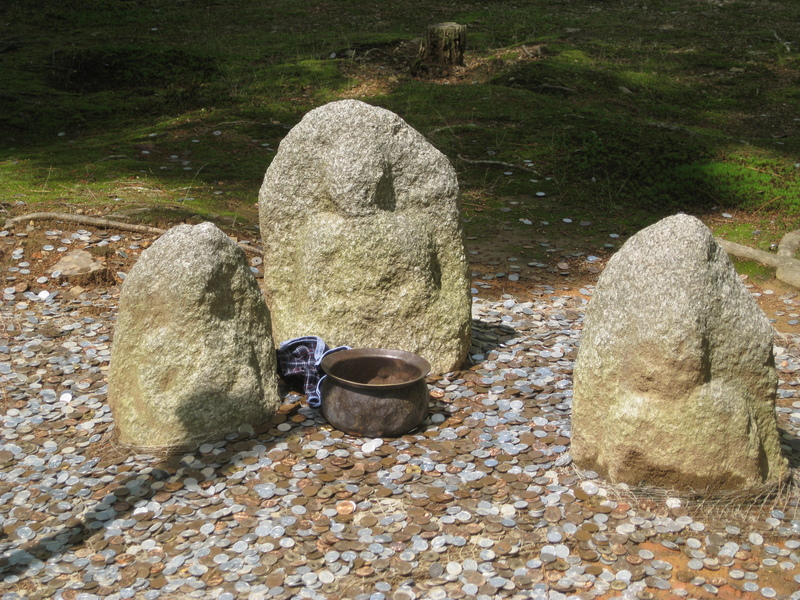 Guarded again by 4 deities. 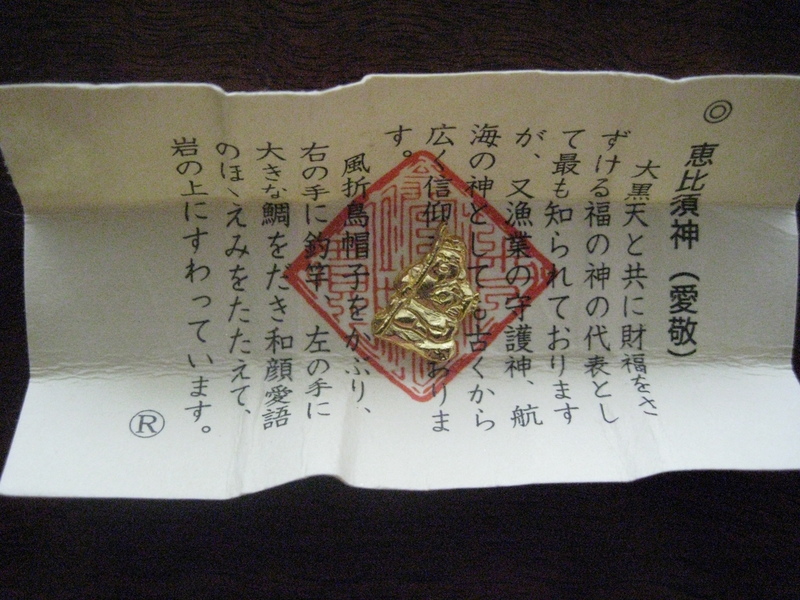 With all these Buddhas around, someone is always around to tell a fortune. 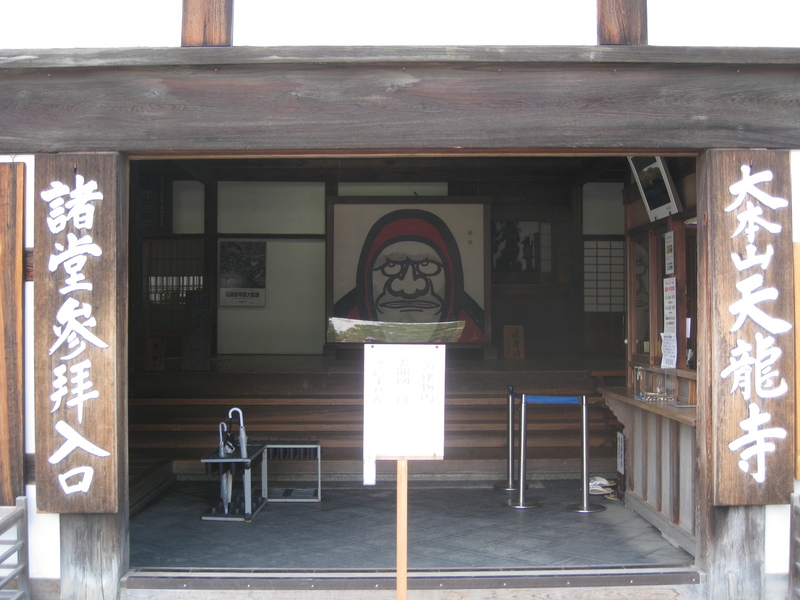 Ebisu was the lucky guy- one of the 7 Lucky Gods of Japan – but before he spilled his secrets I received the famous Japanese cross arms of “No Pictures” as I focused on the translation diagram. Offspring #2 recounted the number of times I’d been the recipient of the cross arms – it was a day’s record. A hash marked list. Three World Heritage Sites. Several National Treasures. All items crossed out with a strong black pen mark. Stuffed back in the purse. One hour left with the cab driver. Ample time for another stop. Temples and shrines peek out from every corner in Kyoto. No one turned, just a slow, forward shuffle toward the cab. No response. The cab driver opened the door and gave me an empathetic smile. That got a response. Of disgust. A bell tolled somewhere in the Ivory Tower of a Fortune 100 Company. Three witnesses able to tell the tale that retirement had not eliminated target chaser contained within. Oh well- the younger ones might grow in to it. 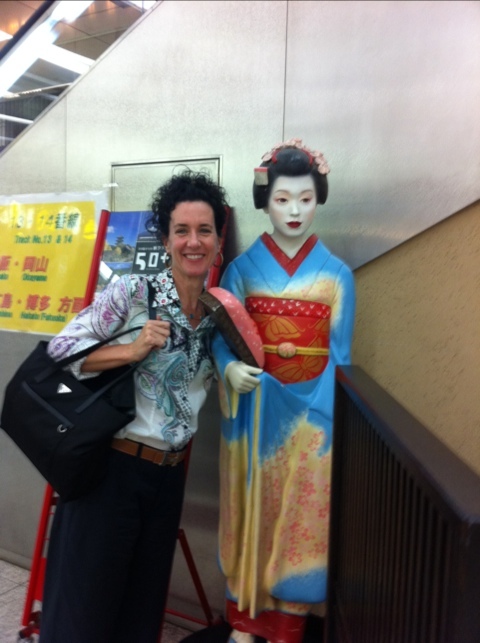 The cab driver and I dropped the hostiles at the hotel and spent the remaining hour looking for Geisha. 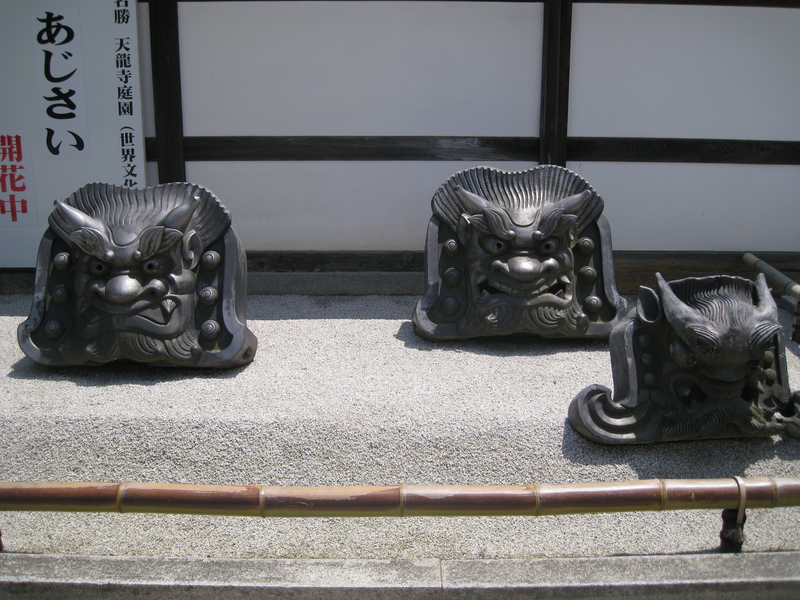 This entry was posted in Uncategorized and tagged Amblerangel, Culture, Emily Cannell, ExPat, Family, Hey From Japan- Notes on Moving, Humor, Kyoto, Meiji Shrine, Mom, Moving, Offspring, parenting, Rokuon-ji, Sanjusangen-do, Tenryuji Temple, The Golden Pavilion, Travel, Vacation, Zen Buddhism. Bookmark the permalink. I want one of those “Mr Smiley” sculptures! 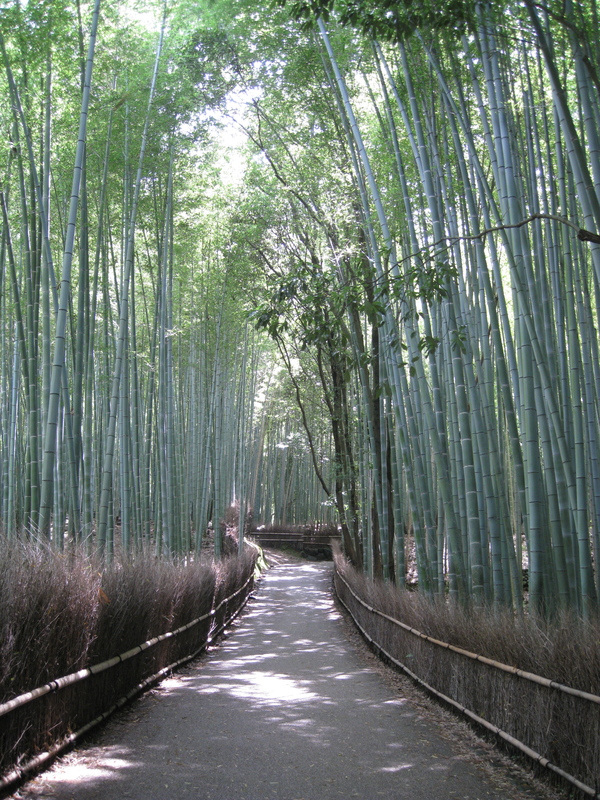 Even though I’m a magnet for mosquitoes, I’d still like to see the Bamboo Forest. Amazing how people will sign their names when they’re defacing something. Probably the same kind of people who will videotape themselves committing a crime. I really do love those sculptures. I think I have to be careful what I pick up in the way of “House Treasures” for fear of looking like one of those people that moved overseas and bought every item representative of that nation as a memento. Then get it all in the house and have it look like a junk yard for foreign kitsch. Thin Lips left two days ago but I think she really felt like she say Japan! You should have paid the mosquitoes to carry Grandmama when she got tired. LOL!! Next time I’m wearing a bee suit. I bet Lexingtonians will soon figure out how to hire the local mosquitoes to carry there lazy asses from couch to toilet, toilet to couch. “Lexington, Kentucky, where Only the Mosquitoes Sweat.” I’ll be sure to have a swarm of the little guys lined up for your visit. Or maybe the Nose has already handled that detail. Great post, Emily! Can’t wait to see you! Hahah! Great latest post too about Lexington being the most sedentary city in the US! Hilarious Kathy! Should I send a swarm to pick you up for lunch? Tori- Kids NEVER grow out of the ice cream phase!! You win!! You outlasted the whole family! Haha, I think you and I travel similarly. I was alone in the end though….. But I do like to get my money’s worth! Hi Emily! We just came back from 8 days in Kyoto… I was in Arawashiyama (where the Bamboo Forest is) on June 24… got there on the JR (fast), then up the mountain to see the monkeys (my kids 16 and 11 liked it), then Tenryuji Temple plus bamboo forest and nearby samurai actor’s house, before troop resigned. We went to Tokyo for one single day and went to Tokyo Tower based on your post. Both my kids loved it! Also went to Harajuko but not on the weekend so we didn’t get to see the kids dressed up cos’play. In Kyoto, on our last night, took the kids and husband to Kyoto Ninja Restaurant. Big big hit!! 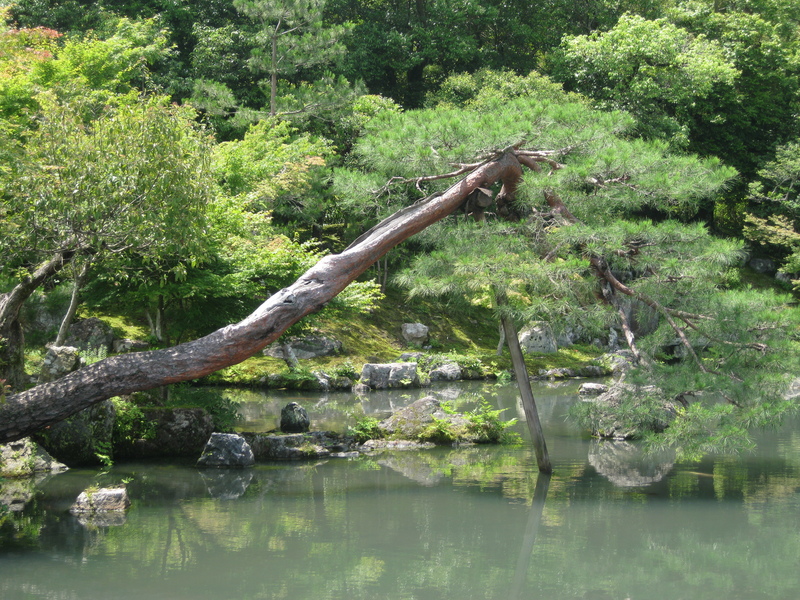 I was so hot in Kyoto, I finally understood why they sell so many handkerchiefs. How many days were you there? 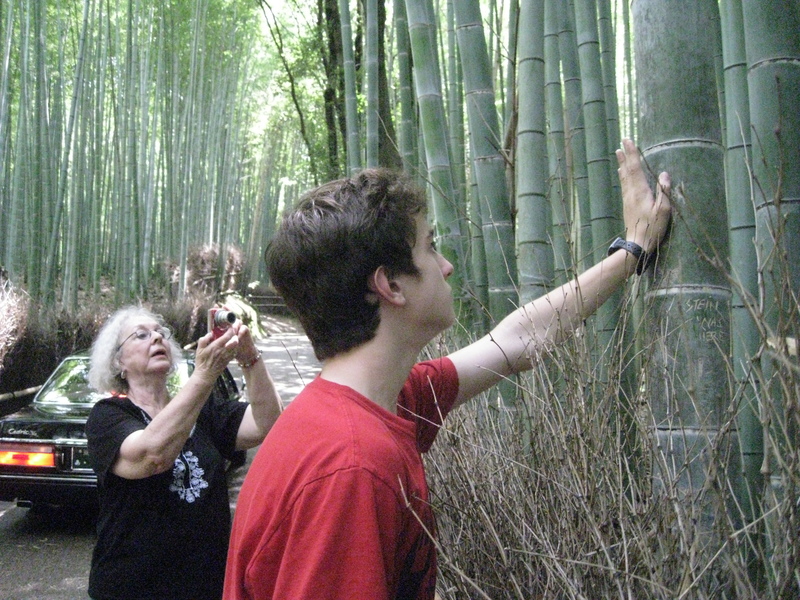 Don’t tell me we were in Arashiyama on the same day!! We were there on the 22nd about—- so glad you had a good time! What did they do at the Ninja Restaurant? Did they fall out of celings too? I love a ninja. SO glad you had a great time! Sounds like you must have hit it all! When you first get to the restaurant, it is dark inside and you have to go thru a laberynth to get to your table. Once there you pick from the menu, and the food is part of the show, some food comes with a sword thru it, other food comes inside an egg, and so on. When you finish your meal, a Ninja magician comes to your table (if you go, sit kids on the ‘out’ part of the table) and there’s fire, jokes, tricks, etc. When you finish your meal, a couple of ninjas will jump out at you with a banner “Have a nice day!”, never mind that it’s dinner time hehe. My 16 year old liked it. I love that they jump out! I wish the other place was open- I hear it won’t be until 2012. Sounds like ya’ll had a great time. What were your two favorite spots? A must funny moment at the Ninja restaurant ocurred when I read they were offering the following item in the menu (I’m reading from the picture I took): “BLACK COD AND SEASONAL VEGETABLES IN SHICHIRIN GRILL IN THE ART OF MIMETIC PENETRATION”. I couldn’t stop laughing and the 16 year old was most embarrased. The 11 year old didn’t get what was so funny. What could they possible be trying to translate??! Hahah! Was that worth the trip? What is the name of the restaurant? Enjoyed that! 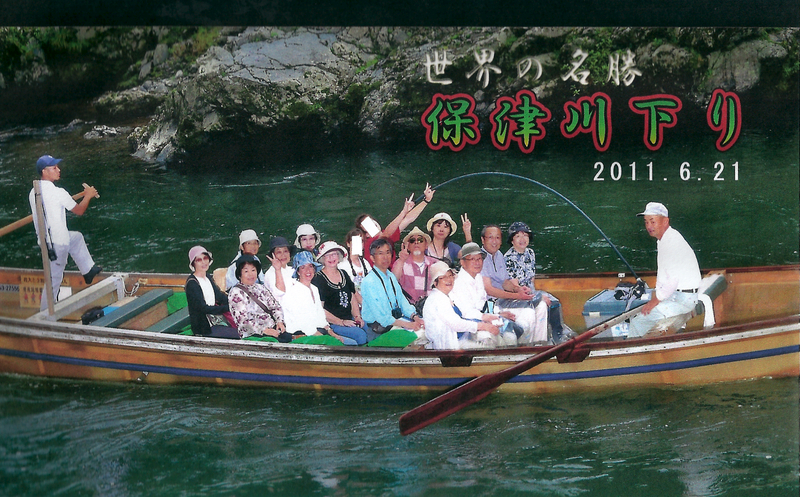 I covered all the biggies in Kyoto in one day, but we used bikes! My friend who was visiting was a little peeved, but we did it! haha! Onto the grandmother….get her a massage! I did that to my grandmother when she came to visit me in NYC. I made her walk everywhere and it wasn’t until about 6PM when it dawned on me that she’s over 70!Oops…. Exactly! running someone over 70 all over at break neck pace in the heat is not a good idea- BUT- I’ll happily repeat this agenda when the sisters come to visit. They best start training now! I hope your Grams is okay. 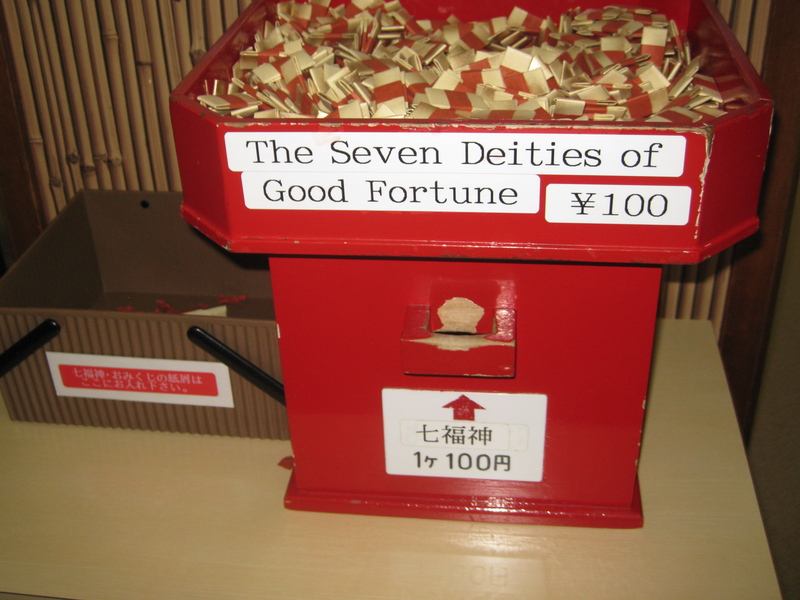 I am totally target fixated about my goal (ONE DAY I WILL VISIT JAPAN, KITTO!!!) but I dont have any dead bodies… yet. Thanks a lot for the laughter! Hahah! Thanks so much and I’m glad it’s entertaining—- believe me, when you come to Japan- you might leave a few in your wake! I’m so glad you did! Thanks for stopping in Jo. Thanks for coming over! I just love Lisa’s blog- now if I could just get my pictures to turn out more like hers…. what a great blog. your writing is witty and is very entertaining. great photos. i would love to have visited all those amazing spots. a lot of good energy! Thanks so much! I appreciate your kind comments and am so glad you stopped in!